We know that earth is divided into longitudes and latitudes. Accordingly the Earth has different climatic zones resulting in different kinds of biomes and forests around the world. 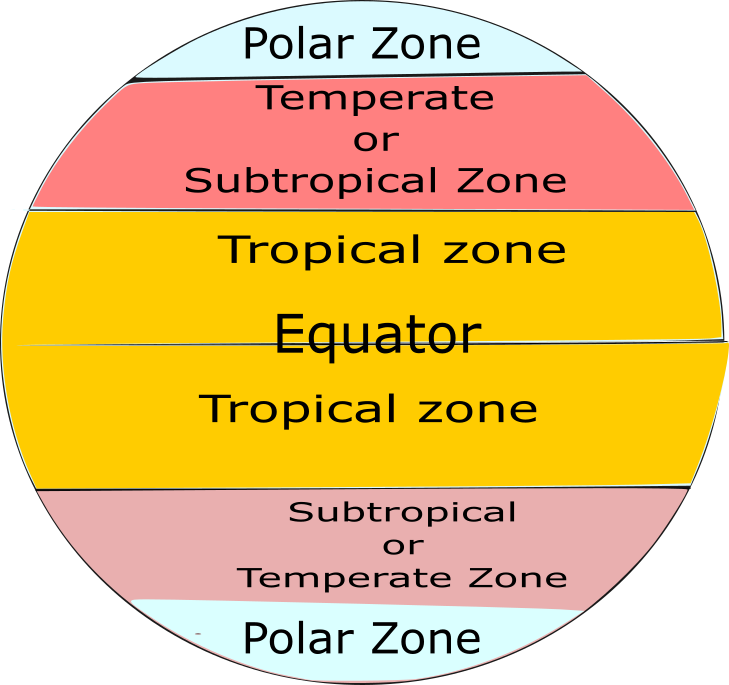 Tropical rainforests lie near the equator. 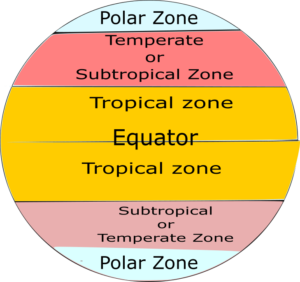 NOTE – The UK lies mostly in temperate zone and thus has very different climate conditions than the countries that lie in tropical zone. The sun lies overhead the equatorial line that is why the climate of this region remains more or less same throughout the year. So you will not see seasons in this region. The atmosphere is hot and humid with an average daily temperature of 28° C. The temperature is never below 20°C and never above 35°C. 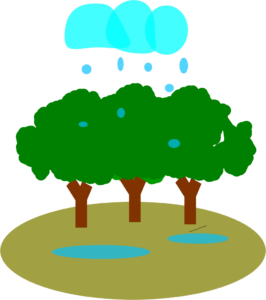 The average rainfall is 2000 mm per year. The weather remains clear in the morning. Gradually as the day pass, the sun starts warming the air and the hot air starts rising leading to formation of clouds. In the afternoon, we see precipitation in the form of heavy rainfall with thunderstorms. In one or two hours the weather becomes clear and the cycle starts again. Soil of the tropical rainforests is not fertile. Though, it is rich in iron and thus looks red in colour. Humus, which is a thin layer of fertile soil formed with the decomposition of dead leaves and organisms is found at the surface. But, due to heavy rainfall all the nutrients are easily washed away. Tropical rainforests are habitat of more than half of species of plants and animals in the world. The warm and wet climate provides ideal conditions for plants to grow which means you will also find animals who depend on these plants for survival. Plants in tropical rainforests are mostly evergreen because they shed leaves only partially and produce new ones simultaneously. The trees are usually tall so that they can collect as much light as possible. This leads to formation of canopy which prevents sunlight to reach at the surface. Plant adapt to the extreme humid conditions in the tropical rainforest. 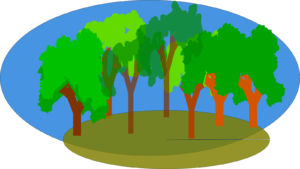 Tree trunks – The trunks of the trees are tall so that they can reach sunlight. Drip trips – The leaves of plants and trees are pointed downwards so that the rain drops do not stay on the leaves. Plants need to shed water to avoid growth of fungus and bacteria in the warm and wet tropical rainforest. 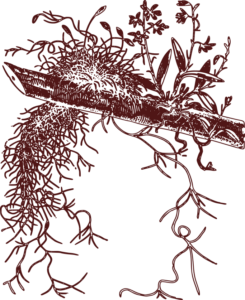 Buttress roots – Massive ridges are formed near the base to provide extra stability to the trees because the roots in the tropical rainforests are shallow. Lianas – These are the climbing woody vines that cover the rainforest trees. 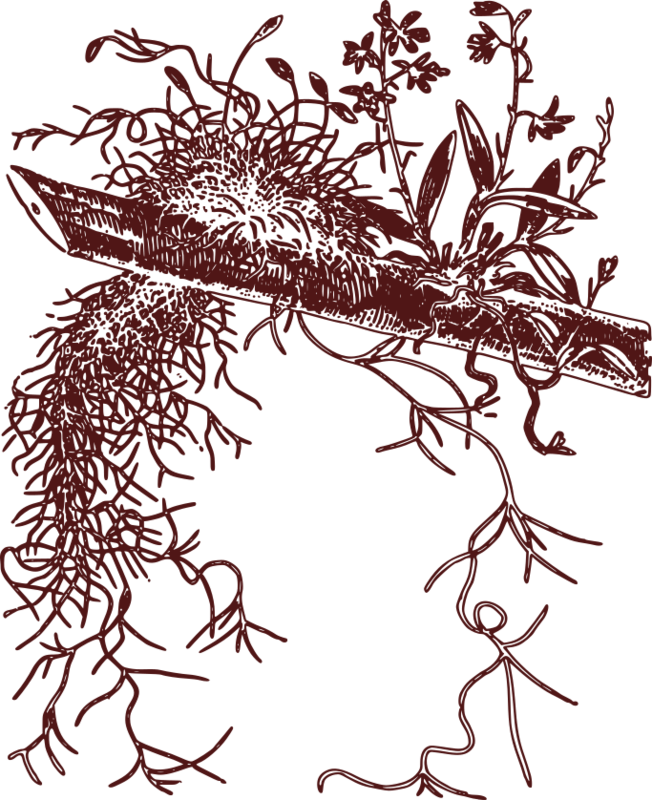 Epiphytes – Plants that live on branches and trunks of other plants. They get their nutrients and moisture from air not from soil. Animals in the rainforests have also adapted to the conditions of tropical rainforests. Camouflage – Animals disguise in various forms by changing the physical attributes to protect themselves from their predators. For example – Sloths move at a slow pace to avoid being seen by their predators. Also, the fur of a sloth is covered with green algae which help him blend with the surroundings. Boa uses its camouflage invisibility to sneak up on its prey. Rainforest grasshoppers are so transparent that they easily blend their coloring with the leaves. Habitats – Spider monkey uses its long tail to climb on the trees of tropical rainforest and swing from tree to tree to avoid the predators living on the ground. Even Sloths live on tree hanging upside down from the branches. Eating habits – Some animals adapt to depend on limited food items so that they don’t face competition for food. For example, Toucan with the help of its long beak, eat only fruits which hard to reach by other birds and animals. Also, the beak helps to cut fruits from branches which are too weak. Emergents – Tallest trees which emerge out of canopy. Canopy – It is the part which is exposed to sunlight and form a roof like structure for the plants below it. 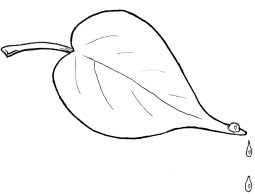 The Understorey – This part do not get sunlight and is very moist and humid. It consists of small tree and shrubs. The leaf litter or Cryptosphere – The decomposition of dead and decayed leaves form a rich organic layer called humus. Interesting fact – Half of the world’s tropical rainforest is found in Amazon river basin in South America. Why tropical rainforests are depleting? Deforestation is one the major reasons of the depletion of tropical rainforests. Activities that lead to deforestation are farming, logging, mining, construction of roads, creation of hydroelectricity stations and increasing interference of human activities due to increase in population. What will happen if tropical rainforests are destroyed? Destruction of nature has inevitable negative impact on the environment. It is not only harmful to the animals living in these forests but directly and indirectly affect our lives too. 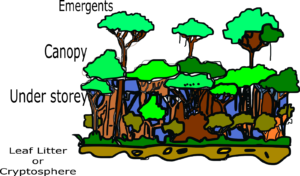 Loss of habitat – The animals living in the forests will lose their home and will eventually extinct because many of the species living in these forests depend on the certain type of plants and trees for food and survival. There are many species which are unique and are only found in these forests because they are adapted only to living in these environments. Soil erosion – Clearing of trees leads to soil erosion because the roots holding the soil ar not there. Thus, it leads to washing away of soil and its nutrients. The soil become infertile and do not support plant growth. 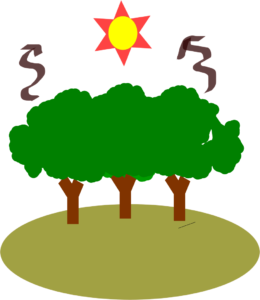 Climate change – Plants are responsible of the absorption of carbon dioxide from the atmosphere. Cutting down of trees from forests eventually leads to excess of carbon dioxide and thus causes global warming. 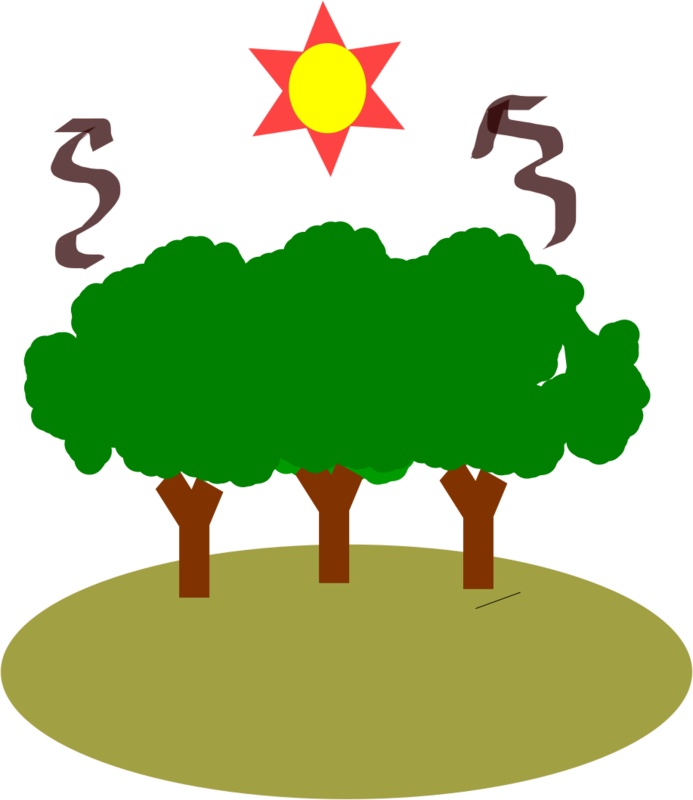 Global warming is heating of the earth which leads to fluctuations and changes in the climate. Economic development – Forest provide timber, medicines, fruits etc. to us. These things generate income for a country and thus improving the living standard of the people living in the country. The cleared forests are also used for farming which also generate food for the country’s population.